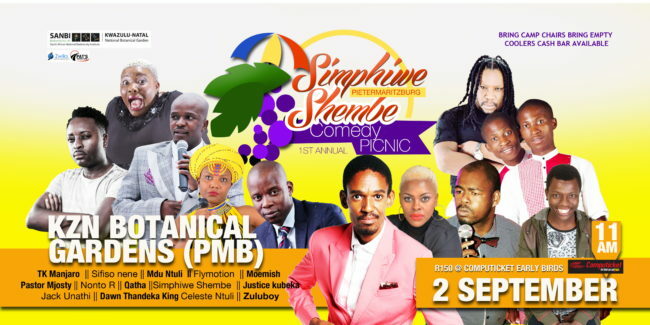 This spring will see the first annual Pietermaritzburg Comedy Picnic held at our KwaZulu-Natal National Botanical Garden on the 2nd of September 2018. The one of a kind show will feature comedians from all over the country. The list of comedians includes Celeste Ntuli, Thenjiwe (UK), Dawn Thandeka King (Uzalo), Simphiwe Shembe, TK Manjoro, Sifiso Nene and Flymotion, just to name a few. There will also be musical performances by Joocy, Zuluboy and a local traditional dance group. Tickets are R150 per person at Computicket and R180 at the gate. Please bring camp chairs and picnic blankets. There will be food stalls and a cash bar provided therefore, food and drinks bought somewhere else will not be permitted in. Gates open at 11:00AM and the show starts at 12:30PM.